For sports fans with disabilities, getting out to see your favorite baseball or basketball team can be a major hassle. With only the Americans with Disabilities Act as their guide, some sports venues are better than others at accommodating disabled fans. The New Britain Bees baseball team has launched a major initiative to make the stadium and the game easier for disabled fans to manage. The mastermind behind the program is Bryce Weiler. The 26-year-old is a part-time sports announcer at the stadium, but he's been brought in by the Bees organization for a more important task: to make the stadium more accessible. Weiler is blind, and his mission is to enhance the game time experience for others with disabilities. He said the idea started for him back in college at the University of Evansville, when he was invited by the head coach to sit on the bench during basketball games. "That really changed my life," Weiler said. "Because for a few hours, I got to forget that I may not be able to live my ultimate dream of being able to see. And I just got to enjoy sitting on the bench and being with the players and coaches, and getting to shoot free throws on the court, and throw chest passes and bounce passes with the managers and coaches." Weiler came up with a list of initiatives that he believes will get disabled fans a little closer to the same experience as able-bodied fans. According to Gerry Berthiaume, the general manager of the New Britain Bees, incorporating Weiler's programs was a natural progression for the stadium, which was built in 1996 with wide concourses and wheelchair lifts to accommodate disabled fans. "The gentleman -- who was the director of parks and rec at the time for the city -- he happened to sit on the Americans with Disabilities Act board, and so felt very strongly that if we are going to build this facility, we are going to make sure that we'll have folks with disabilities who will have the ability to sit just like anyone else." 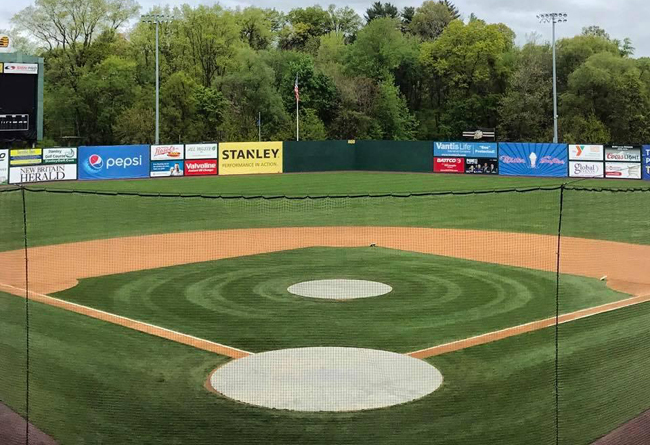 With Weiler on board, Berthiaume now believes the New Britain Bees will become the most disabled-friendly minor league ballpark in the country. In the coming months, the team will start providing personal translators to deaf fans who will interpret public address announcements and other information. Weiler said that for blind and partially blind fans, the stadium will offer the concessions menu in Braille, and make it easier for these fans to find their seats. "I'm going to be able to show them how to find their seat with tactile clues," Weiler said. "They could have a tactile strip that runs along the concrete that someone could trail with their foot or their cane." Blind fans can also take advantage of tours on non-game days so they can familiarize themselves with the stadium. For fans on the autism spectrum, the stadium will provide noise-canceling headphones, fidget spinners for children with autism, and designated spaces where those fans can walk any off extra energy. Jonathan Slifka, who is Governor Dannel Malloy's Liaison to the Disability Community, supports Weiler's initiatives. "Obviously, the ADA is out there, and they look at what's required, and they do the bare minimum," Slifka said. "Looking at these programs that Bryce has put together here, these are programs that go far above and beyond the bare minimum. They would do well to look at programs like what Bryce has put together, and try to achieve some of these goals. It would go a long way to bringing in a segment of fans that are overlooked." There's one more program Weiler is lobbying the Bees to implement. It's an idea that hearkens back to his days sitting on the bench during University of Evansville basketball games. "I'm going to be giving these fans the opportunities to play on the field before some games," he said. "We're gonna have them hit; we're gonna have them throw -- throw balls, catch balls, maybe run the bases, because so many disabled individuals don't have the opportunity to play sports, or get to be on a baseball field and swing a bat or throw a ball. And I want to give them that opportunity. Because it's kind of boring to just fix up a stadium and come to games. Don't you?" Weiler has contacted dozens of professional sports teams around the country, offering the same program being implemented by the New Britain Bees. He admitted it's been a frustrating experience. So far, only two teams have expressed interest in the program: the Baltimore Orioles, and the Bees.